Wow. I have to admit I wasn't so sure how I was going to feel about this book. The enticing cover and rave reviews had me curious enough to pick it up at the store when I saw The Night Circus. I have to admit that I am very glad. 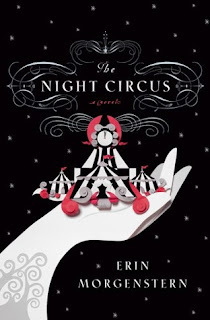 There is something magical about the writing style of Erin Morgenstern that I encountered in this book. I felt like the words had their own magical dance as much as the circus they were describing. I felt mystified by them. It was such a pleasure to read. The plot itself might seem like it moves along slowly but I don't really feel like that is the case. I think it's all in the way you read it. If you are look for that simple love story where two characters meet and make lovey dovey eyes at eachother, then ya the plot is slow. I think this book is so much more complex then that however. I was a little confused by the years at the beginning of the chapter, it did bounce around quite a bit. I really didn't feel like it made a difference as far as reading it though. The love story in this was so unique in the fact that a large sum of it takes place without the characters even meeting eachother. Due to that fact you really feel their angst and their devotion to eachother. So when they finally meet you can feel the explosion of chemistry between them. The circus itself was amazing. I'm reading to run out into a field and see if the circus has come to my town. The descriptions and the ideas for the acts were terrific with rich details. I am definitely a Night Circus reveurs and will be wearing my red scraf.